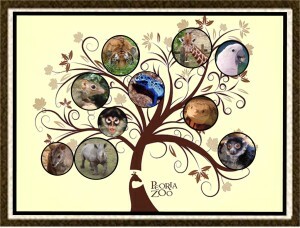 with a gift to your favorite Zoo residents. Select and item from our tree and purchase directly and deliver your gift to the zoo yourself or have your items shipped right to the Zoo. Your generous gift will be used as “BEEP item” in our Behavioral Enrichment and Enhancement Program. 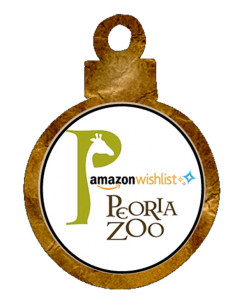 The Animal Staff has developed an Amazon "wish list" - a list of items needed to enrich the lives of the animals and enhance the guest experience. This holiday season, please consider stopping by our Giving Tree located in the Tropics Building or check out our "wishlist" on-line at Amazon and select a much needed item from our Giving Tree. Thanks again for your donation! We really appreciate it. You will receive a "Giving Tree" keepsake ornament with every giving tree donation. Support the Growth of Peoria Zoo! The Peoria Zoological Society is a not-for-profit organization dedicated to supporting and realizing the vision for the new Peoria Zoo. We ask that you support us today with a tax-deductible gift. Donations may be made by clicking here and selecting "Mission Fund" on the drop down toward the end of the form. Donations can also be made at the Zoo front desk or by calling 681-3500.